For the first time, an international team of astronomers, including 3 researchers from Paris Observatory, established a direct link between Saturn auroral emissions in UV and radio. 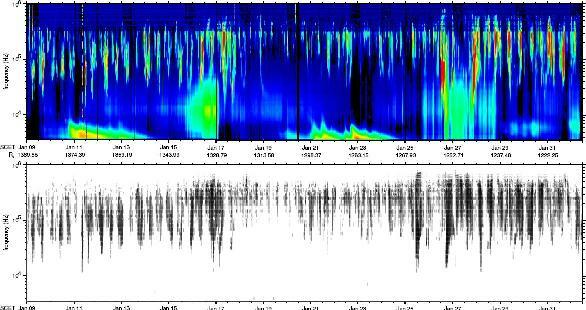 This link was already shown in the case of the Earth via measurements of satellites just above the auroral regions. However, the underlying physics of auroral emissions on Earth and Saturn are partly different: if the microphysics of the radio and UV emissions is the same in both cases, the magnetospheric processes on a larger scale causing energetic electrons to precipitate towards the magnetic poles are different. On Earth, UV and radio aurorae are more frequent around 22-24h Local Time, while more around 8-12h in the case of Saturn. 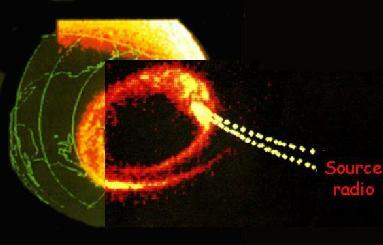 In this article published in Nature, the radio observations were carried out by the RPWS (Radio and Plasma Wave Science) experiment onboard Cassini, and the UV observations by the STIS camera of the Hubble Space Telescope, during a joint campaign in January 2004, 5 months before Cassini entered in orbit around Saturn. 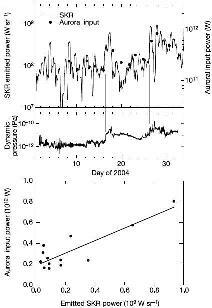 The team of astronomers showed that the variations of UV and radio aurorae are well correlated to each other and to the fluctuations (of pressure, in particular) of the solar wind at Saturn level (cf Figure 2). 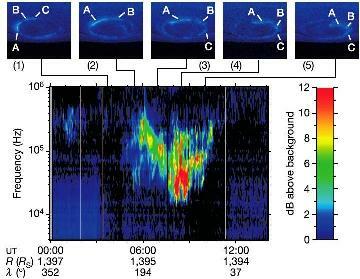 In particular the southern auroral radiosource was identified with a bright UV arc (noted "A" on Figure 3). However, contrary to the aurorae on Earth, the Saturn aurorae are not strictly fixed in local time, but simply restricted inside an interval of a few hours of Local Time, inside which they are in partial corotation with the planet. The radio emission (at the local electronic cyclotron frequency), very anisotropic, is maximum at 55-70° of the magnetic field in the source (which explains the difficulty to find out UV-Radio correlations on a small temporal scale). These figures are close to the values on Earth and Jupiter, and confirm the assumption (supported by other arguments) of a common microscopic generation mechanism. To obtain the correlations presented here, a "polarization filtering" of the data was developed at LESIA (where was designed and built the receiver HFR, principal subset of RPWS). This filtering allows to isolate the auroral radio emission of Saturn from the other emissions which are superimposed to it (cf Figure 4).